Phenotyping, or measuring key traits of crops such as drought-tolerance, is crucial in breeding and genetics because it helps to speed up the development of improved varieties. At ICRISAT, the Lysimetric approach is being successfully used for phenotyping, particularly for plant responses to water-stress related to drought, and climate change adaptation. Lysimeters are simply PVC tubes filled with soil to measure plant water use. ICRISAT’s lysimetric facility has 2800 tubes of 1.2-m length and 20-cm diameter, and 1700 tubes with 2.0-m length and 25-cm diameter. These dimensions give the plants the soil depth and aerial spacing similar to field conditions. Lysimeters complement other phenotyping activities both in the field and in controlled environments. The Lysimeter approach provides a bridge between field-based and laboratory-based research. It enables the collection of precise data on water-consumption (quantities, timing) that is related to agronomic data (grain yield), and provides information on traits that contribute to yield increase. 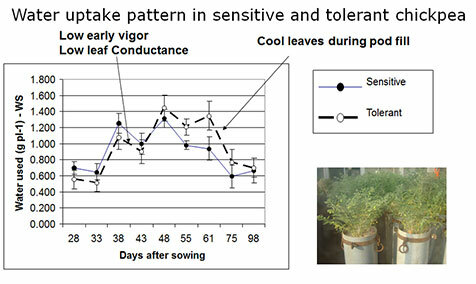 For instance, in the study of water uptake pattern in sensitive and tolerant chickpea (see adjacent figure), total water extraction was found to be less important than the timing of water extraction. Using Lysimeters, it was established that higher water uptake during the chickpea grain filling period is critical to reach high yields under drought condition. The Lysimetric approach can be applied to almost any crop. Selected germplasm variants are now included in breeding programs to develop cultivars adapted to drought and climate change, particularly in vulnerable regions [such as Western, Central, Eastern and Southern Africa], through such projects as HOPE and Tropical Legumes. 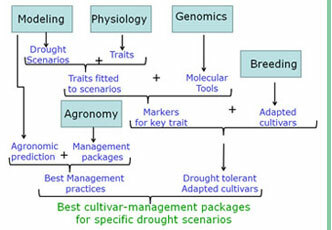 Phenotyping data is combined with inputs from other disciplines (genetics, breeding, modeling, agronomy) towards the development of best cultivar/ management packages fitted to specific drought scenario (see diagram). ICRISAT’s Lysimeter facility for phenotyping is the first of its kind in the world. Thousands of plants are tested every year now at ICRISAT’s Lysimeter facility. It has been replicated at a small scale by the International Rice Research Institute (IRRI) and the Directorate of Sorghum Research of the Indian Council of Agricultural Research (ICAR), and at a large scale by CIMMYT. Other institutions can also use the facility at ICRISAT. A similar facility has also been established at the ICRISAT station in Niger to tackle the interaction between drought and low fertility problems. Training of young scientists from national programmes of Africa is also being pursued vigorously. Ecophysiological traits identified through the approach are relevant to any location facing similar atmospheric/weather constraints and harsh environments, such as the semi-arid tropics of Asia and sub-Saharan Africa. Development of a high throughput computerized platform based on 3-D images is now being set up to assess transpiration response to high evaporative demand and leaf canopy development of crops. It will be used for the large-scale screening of plants (about 1500 plant/hour) to be linked and integrated into genomics and breeding works to speed up the development of improved, drought-adapted crops. Further advancement and impacts will depend on the development of a large phenotyping network, containing both trait-based platforms (Lysimetric system and 3-D image) to harness the genetics of key traits, and field-based phenotyping, locations of which would be decided based on scenario analysis. Combined with the power of genetics, the knowledge of markers for best-fitted traits and trait combinations will allow the intelligent tailoring of cultivars most adapted to specific drought scenarios. Using the Lysimetric system, we have screened germplasm of sorghum, pearl millet, foxtail millet, peanut and other crops, and found very large variations for transpiration efficiency (TE, i.e. biomass produced per unit of water transpired). More exciting is the discovery in pearl millet and sorghum that high TE variants have the capacity to restrict transpiration under high evaporative demand (also called VPD, i.e. the vapor pressure deficit, an index of the dryness and temperature of the atmosphere). In other words, at high VPD, they save water. Similar research is on-going in other crops. We hypothesized that transpiration restriction under high VPD could be related to hydraulics restriction within the plant, in other words, a restriction to water flow that would in turn limit transpiration when the pulling force of the VPD is too high. In living organisms, aquaporins are membrane transporters for water and serve as “facilitator” for water movements. Therefore, we hypothesised that aquaporins could be involved in these hydraulic differences. We indeed found very large differences in the amount of certain aquaporin gene transcripts expressed in both shoot and root tissue when exposed to high VPD, between high TE (efficient) and low TE (inefficient) genotypes. In summary, we have here some very clear evidences linking the expression and function of a gene (aquaporin), which relates to a plant mechanism (the capacity to restrict transpiration) itself, leading to a phenotype of key importance to improve water productivity (TE). Using crop modeling, we were also capable of simulating the effect that this plant trait (the capacity to restrict transpiration) could have on yield in target sorghum growing regions. First, stress patterns were characterised and showed to differ. In other words, parts of the target region are more severely affected by drought. Simulation then showed that if the capacity to restrict transpiration under high VPD could be bred from an efficient genotype (orange bars), into an inefficient genotype (blue bars), the yield would increase, especially in regions where stress is very severe. So, crop simulation is a very powerful tool to: (i) predict possible effect of any given trait, or trait combination, or trait-by-agronomic management combination, on yields, which allows to avoid costly investment in breeding for traits that have low value; (ii) prediction are targeted to specific regions and come with a probabilistic assessment of the chance of success and an estimate of possible yield gains. Similar work is on-going for other crops as well. Given below is a map of a block of locations in West Africa, where we used a weather grid of 1° x 1° (about 100 km x 100 km), and tested the effect of having the transpiration response to VPD trait in peanut. Similar work is on-going in other crops. especially in the northern latitudes.